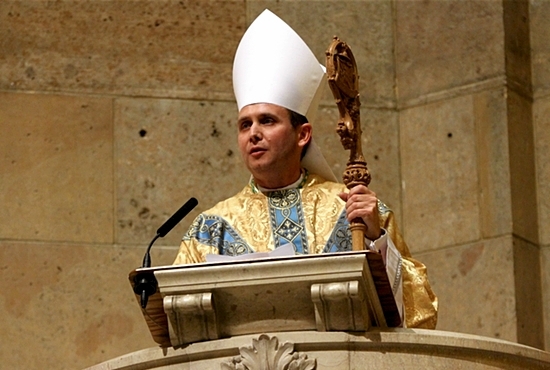 Bishop Andrew Cozzens delivered the following remarks to the assembly at his episcopal ordination Mass Dec. 9 at the Cathedral of St. Paul. Listen to his remarks here. Thank you all for coming to celebrate this beautiful day. I want first of all to express my gratitude and devotion to Pope Francis, who chose me for this role. I promise to always seek to be an obedient son and servant of the Holy Catholic Church. I thank you, Archbishop Nienstedt, for ordaining me and welcoming me so warmly into the leadership of this archdiocese as your auxiliary, and Bishop Piché for beginning to teach me the ropes of being an auxiliary bishop. I am grateful to be called by God to serve you both in the service of this great archdiocese. I would also like to thank Archbishop Flynn who ordained me to the priesthood and Bishop Sirba for your friendship and support, both of you are great examples to me. To all the other bishops, thank you for welcoming me into the college of bishops so warmly; it has made this transition much easier. To all my beloved brother priests, thank you for so many years of support, the friendships I have with many of you are the greatest gifts of my life. To the deacons and especially the many religious who have allowed me to serve you as a spiritual father, thank you. Your love for Jesus has changed my life. I stand before you today my brothers and sisters as a sinner. I am a sinner who has received the incredible mercy of God our Father, the mercy revealed in the life, death and resurrection of Jesus. The mercy poured out through the Holy Spirit in the Church. Now, I also stand before you, in a new way, as a living representative of this same merciful Father and as a member of the apostolic college upon which the Church is founded. An Apostle is one who is sent. The Father of the universe, who created everything, who knows you intimately, the Father who loved you so much that he sent his son into the world to die for you and me and so reconcile us to himself — this Father has sent me. He has sent me to you to proclaim in Jesus’ name, the new life which he offers to the whole world. My brothers and sisters, you and I know that the Church is full of sinners. We have all read about it in the newspapers. But how important it is to remember that these sinful members do not define the Church. In fact, the Church herself is indefectibly holy. Why? Because she is also an inexhaustible font of divine life. And, although we should never make excuses for the sinfulness of the members of the Church, especially her ministers, and we must always seek justice in the face of wrongdoing, we must also remember that the sinfulness of the members cannot change the holiness of the Church. Why? Because Jesus Christ lives in his Church. Because the grace of Jesus Christ is continually poured out in his Church through the word and sacraments. Because Jesus Christ is the foundation of the Church, which cannot be shaken. You and I must seek to live more and more lives of holiness. We must seek to live the fullness of the truth of the Gospel of Jesus Christ. We must seek to become holy as Jesus is holy. It is very simple: It means to let God love you. It means to let his mercy and healing love flow into the very depths of your being so that it wipes away your sin, heals your deepest wounds, and renews and regenerates you to be like Jesus. To be holy is to love like Jesus! In order to love, we must know that we are loved. We must know what it means to say, like Jesus, I am a beloved son, or I am a beloved daughter of God. Holiness is living in his love. This is why I put 1 Corinthians 13 on my holy card. This is a description of how Jesus loves us: Love is patient, love is kind, it rejoices in the truth, it bears all things, believes all things, endures all things. When we receive this kind of love from Jesus, then we are able to love with his love. My brothers and sisters, in closing, let us turn our eyes to Mary, conceived without sin. Sometimes because she is without sin, we think she is far from us. But it is sin which separates us from one another. In fact, because she is conceived without sin, she is even closer to us than we are to each other. She desires to share with us her holiness. Let us ask Mary to give us her heart — her heart so full of love and humility, her heart so full of reverence for every person, her heart which loves Jesus and wants to see his healing love flow out upon the whole earth. With Mary’s heart we can love the world with Jesus’ own love.